Carpenter’s Shelter began informally in the winter of 1982 when Father Tony Casey of Blessed Sacrament Catholic Church in Alexandria opened the doors of the sanctuary to the homeless community. With only modest resources—two volunteers and ten cots—Father Casey continued to offer refuge from the harsh winter weather for the next six years. When Blessed Sacrament Catholic Church’s building was torn down in 1988, a small group of dedicated individuals decided to continue their work, formally founding Carpenter’s Shelter and acquiring rental space at a warehouse on North Henry Street. From there, Carpenter’s Shelter moved to a retrofitted DMV office for twenty years and now, calls a former Macy’s at the shuttered Landmark Mall its temporary home. In our mission to end homelessness, Carpenter’s Shelter follows the philosophy that homelessness stems from a lack of housing and continuously aims to transition residents into permanent, sustainable accommodations in the community. This transition is becoming increasingly difficult due to the scarcity of affordable housing in Alexandria. In order to eliminate this barrier to resident success, Carpenter’s Shelter’s Board of Directors and staff agreed to pursue a concrete solution—redeveloping our facility to a higher and better use. This effort, known as New Heights, will result in a brand new building that includes a purpose-built shelter, 97 affordable apartments—including 10 permanent supportive housing apartments—administrative offices, and an underground parking garage. The New Heights property redevelopment project advances in partnership with the Alexandria Housing Development Corporation and is made possible thanks to the support of Howard Hughes Corporation and neighbors like you! Want to learn more? Click HERE for a downloadable PDF of our New Heights brochure. After years of internal planning, we are thrilled to take our first public steps toward a brand new building with a purpose-built residential shelter, 87 affordable apartments, and 10 permanent supportive housing units. To facilitate the redevelopment project, Carpenter’s Shelter sold our property at 930 N. Henry Street to our partner, Alexandria Housing Development Corporation. While the capital generated from this sale will allow us to buy back our portion of the building, we will still have a funding gap to cover. To fully fund our redevelopment project, we have launched the New Heights Campaign, which aims to raise $2 million to close the funding gap. Quietly launched in the summer of 2018, the New Heights Campaign boasts 100% board participation and promising early fundraising efforts. We will only achieve our $2 million goal with the support of our community. You are an integral part of every milestone our residents reach and you are an essential part of our ambitious next steps. Together, let’s support the homeless men, women, and families with children who need our help today and better serve those will need us for years to come. Consider a generous contribution today! 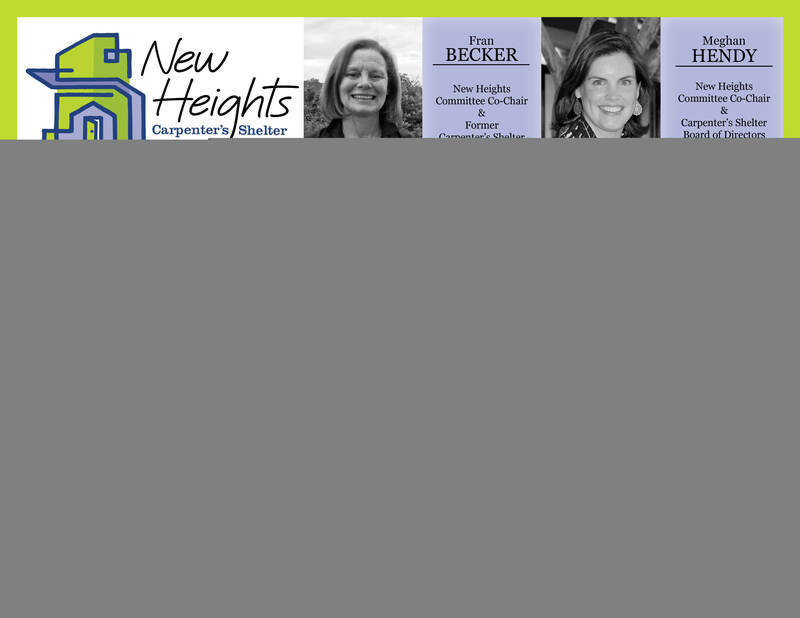 New Heights Campaign contributions are welcome online or by check. All donations of $5,000 or more will be included on a special donor recognition plaque to be displayed in the new, purpose-built shelter. All those who give $10,000 or more may select a naming opportunity to recognize their gift. In order to transform our building from a retrofitted DMV office into a multistory facility housing a purpose-built shelter, 97 affordable apartments—including 10 permanent supportive housing apartments—administrative offices, and an underground parking garage, Carpenter’s Shelter must temporarily vacate the premises for the duration of demolition and construction. 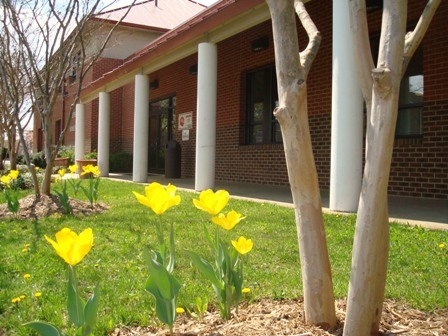 As a service provider in operation 24 hours a day, 365 days a year, Carpenter’s Shelter recognized the need for an interim facility and searched for a location that could host residents, staff, and volunteers and allow uninterrupted access to services during the 18-month redevelopment process. 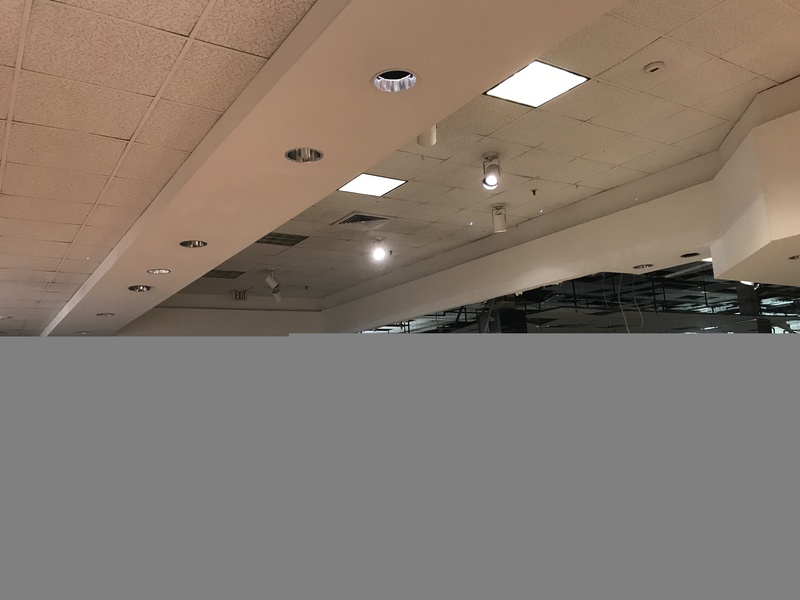 Kerry Donley, a former member of Carpenter’s Shelter’s Board of Directors, spearheaded the search for our temporary home and facilitated early conversations with representatives from The Howard Hughes Corporation ®, owner of the shuttered Landmark Mall. This sentiment led The Howard Hughes Corporation to lease part of the former Macy’s site to Carpenter’s Shelter and inspires its ongoing, active participation in the ever-evolving process of renovating and inhabiting a former department store. Architecture firm Cooper Carry creatively re-imagined the unconventional space and designed the temporary shelter to include individual and family rooms, David’s Place day shelter for our chronically homeless clients, bathrooms, laundry facilities, common spaces, administrative offices, and more. Contractor L.F. Jennings turned Cooper Carry’s design into a reality and H.H. 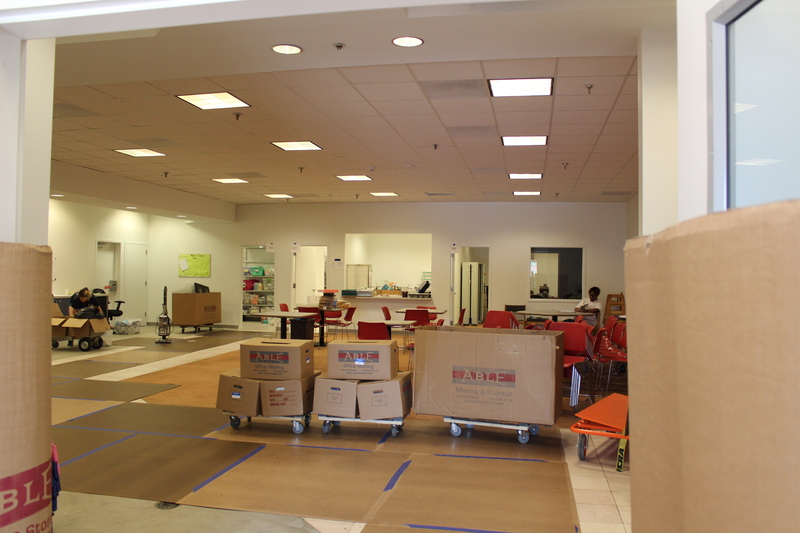 Logistics facilitated a seamless move into the new space. 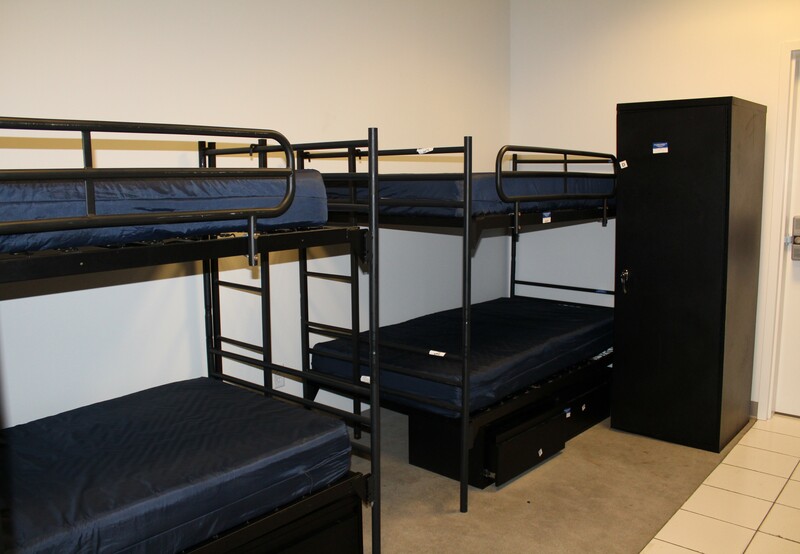 As of Saturday, June 9th, Carpenter’s Shelter operations began at our temporary home on Duke Street! 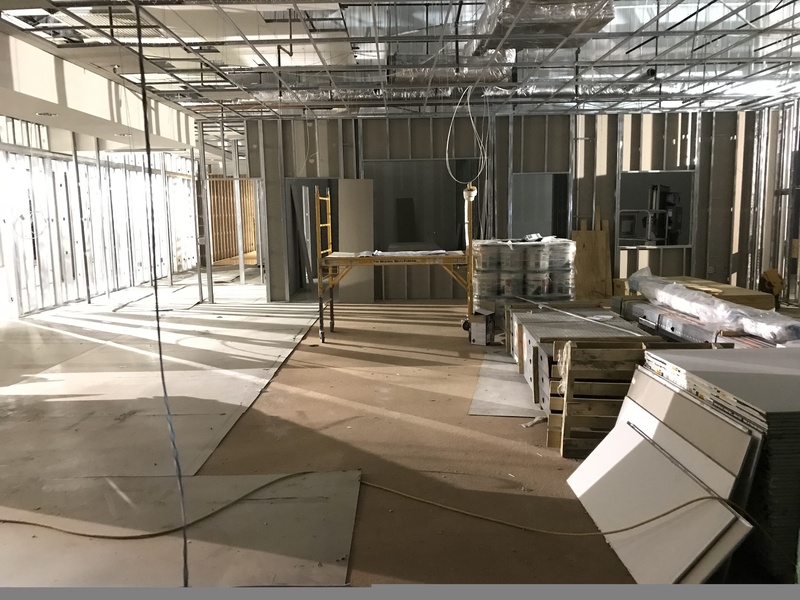 While Carpenter’s Shelter continues to offer uninterrupted services from our temporary home in the former Macy’s at Landmark Mall, the New Heights redevelopment project continues at our 930 North Henry Street property. The property redevelopment process is scheduled to take 18 months. Our partner Alexandria Housing Development Corporation (AHDC) will purchase the property, demolish the building, and begin construction. This effort, known as New Heights, will result in a brand new building that includes a purpose-built shelter, 97 affordable apartments—including 10 permanent supportive housing apartments—administrative offices, and an underground parking garage. Carpenter’s Shelter will operate the shelter and provide services to the 10 permanent supportive housing apartment tenants. AHDC will own and operate the 97 affordable apartments, which will make up an apartment complex named The Bloom. The complex will also have three outdoor terraces, a 1,600 square foot production garden, and playground. 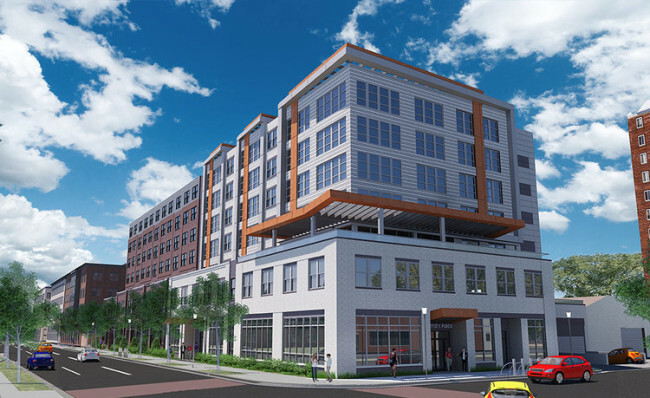 By adding a new stock of affordable apartments, the New Heights property redevelopment project addresses the issue of affordable housing scarcity, a major barrier to ending homelessness in Alexandria. The new building was designed to fit architecturally with the rest of the area and the redevelopment plan complies with the intentions and guidelines outlined in the Braddock Metro Neighborhood Plan. Carpenter’s Shelter’s relocation and redevelopment project has appeared in The New York Times and featured in local news! Browse the articles below to learn more! What will happen during this redevelopment project? Carpenter’s Shelter residents, staff, and services will move out of our current building at 930 North Henry Street, relocate to a temporary space at the former Macy’s at Landmark Mall, demolish the current building, and build a brand new, purpose-built multistory building on the property. Carpenter’s Shelter moved out of our longtime location at 930 North Henry Street and into the former Macy’s at Landmark Mall at the beginning June 2018. The demolition of our current building and the construction of the new building will take about 18 months. The new building will be ready for use in early 2020. We will move back at that time. Will Carpenter’s Shelter stay open during the construction of the new building? Yes! Carpenter’s Shelter will stay open during the relocation and construction of the new building. Only our physical location will change. Will Carpenter’s Shelter add or remove any services at the temporary location? At the new building? Carpenter’s Shelter will offer all of its current services at the temporary location. At the new building, Carpenter’s Shelter will add services for residents such as offering 10 permanent supportive housing apartments. Are the facilities at the temporary location different from the current building? The temporary location is similar in size and feature similar spaces including individual and family rooms, David’s Place day shelter, bathrooms, laundry facilities, common spaces, staff offices, and more. The most significant change will be the lack of a full commercial kitchen. Instead, a scaled-down kitchen will have induction heating appliances, crockpots, and more. How does Carpenter’s Shelter deal with changes in residents’ public transportation needs? 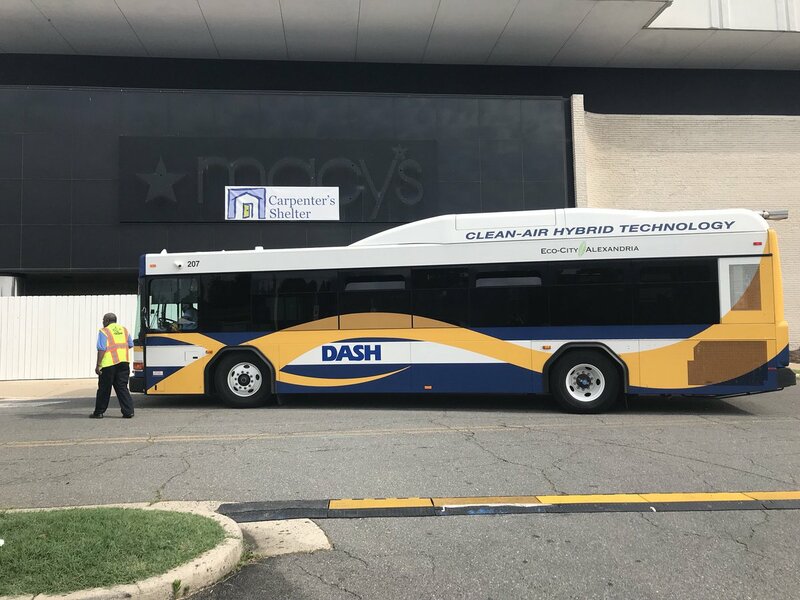 Carpenter’s Shelter has arranged for a daily shuttle for our day shelter (and eventually Winter Shelter) participants, coordinated with DASH to ensure appropriate area coverage, and doubled our transportation support budget. These efforts promise that everyone gets where they need to go! Will youth residents need to change schools during the temporary relocation? No, our youth residents will not change schools during the temporary relocation. Instead, they will stay at their current schools to preserve as much stability as possible. Will the temporary relocation impact the Landmark Mall redevelopment? No, the Landmark Mall owners assure us that Carpenter’s Shelter temporary relocation will not impact their redevelopment plans. Carpenter’s Shelter’s current building at 930 North Henry Street will be torn down and a brand new multistory building with an underground parking garage will be erected in its place. The purpose-built shelter and administrative offices for Carpenter’s Shelter will be on the first floor of the building. The upper floors will feature 97 affordable apartments and 10 permanent supportive housing apartments. The 97 affordable apartments will range in size from studio to three bedroom units and will be available for those making 40-60% of the area median income. Will Carpenter’s Shelter run the apartments above the shelter? Carpenter’s Shelter will not manage the apartments above the shelter. 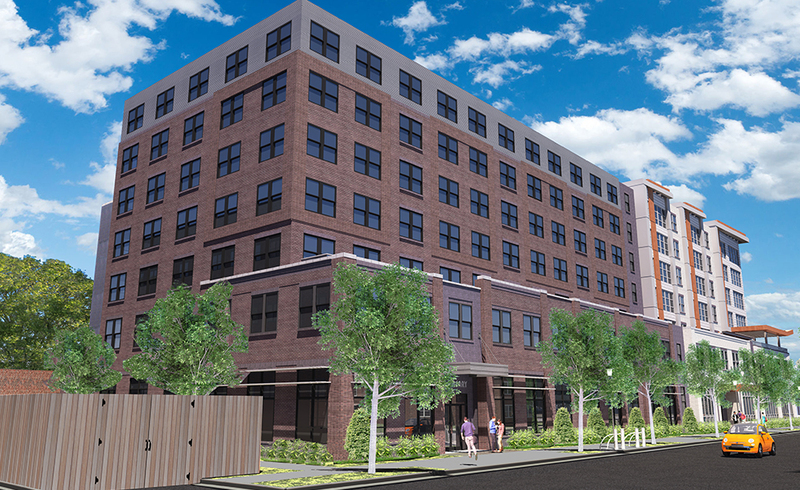 The 97 affordable apartments will make up an apartment complex named The Bloom, which our partner, the Alexandria Housing Development Corporation, will own and operate. Carpenter’s Shelter will oversee the 10 permanent supportive housing apartments and provide services to those residents. Permanent supportive housing is a solution for people who have been unable to transition to stable housing in the community because of significant challenges such as disabling mental health, substance abuse, and/or other chronic health conditions. When a person enters permanent supportive housing, they move into a rent-controlled unit, pay a small percentage of the rent, and have access to Carpenter’s Shelter’s comprehensive supportive services. Is there a time limit on permanent supportive housing occupancy? No, permanent supportive housing is truly permanent. Residents will sign a legally binding lease and can remain tenants as long as they meet its conditions. Will the new building match the rest of the development in the area? Yes, the redevelopment plan complies with the intentions and guidelines outlined for the community as articulated in the Braddock Metro Neighborhood Plan. Is there a need for affordable housing in the area? Yes and the lack of affordable housing is one of the greatest barriers to our residents’ sustainable self-sufficiency in the community. Since the Braddock Metro Neighborhood Plan was approved in 2008, approximately 1,000 new market rate apartments have been constructed in the area; only 10 of these are designated affordable apartments. The market rate apartment rent in this area ranges from approximately $1,500 for a studio apartment to $2,500 for a two bedroom apartment. Why would Carpenter’s Shelter go through all of this? Isn’t the current building sufficient? The Carpenter’s Shelter Board of Directors and staff made the decision to redevelop after careful deliberation. Ultimately, our belief that homelessness is fundamentally a lack of affordable housing determined our course of action. Having access to an additional 97 affordable apartments within our community will create an extraordinary benefit for our residents. Giving to the New Heights Campaign is easy! Click the button below to submit your generous donation!